Located in Norfolk County, Weymouth is the second-oldest European settlement in Massachusetts. The city had a population of more than 55,000 in 2013, based on U.S. Census Bureau estimates. The city has four village centers: Jackson Square, Weymouth Landing, Bicknell Square, and Columbian Square. 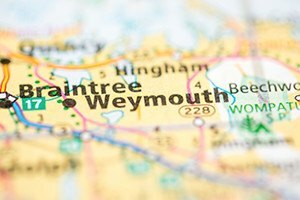 While most of its land is developed, Weymouth continues to redevelop and evolve in its use. The former NIKE Missile Base, for instance, has transformed into the Webb Memorial Park. If you have a work injury or real estate issue in the Weymouth area, Pulgini & Norton can assist you. Our workers’ compensation attorneys offer skilled representation to individuals with job-related injuries or illnesses, and to those involved in real estate matters. Survivor and dependent benefits for family members of a deceased worker. A workers’ compensation claim has to be approved by the employer’s insurer. In many cases, the insurer will deny a claim because it believes the disability is not related to the job, or it may approve and then seek to modify a claimant’s benefits. If your claim is denied, or if the insurer wants to reduce your benefits, you will have to appeal to the Department of Industrial Accidents (DIA). You must provide the DIA with evidence to support your claim, including robust medical documentation of the severity of your disability. We can assist you in preparing a strong claim for workers’ compensation benefits and represent you in the appeals process. Real estate matters require a deep understanding of the applicable state and local regulations, as well as the processes involved in closing a transaction. A buyer and seller of property will need to protect his or her own interest. The purchase and sale agreement will detail each party’s obligations in order to successfully close the transaction. While most purchase and sale agreements are based on a standard form, each party must carefully review the document’s provisions and negotiate terms to protect its interests. Depending on whether you are the seller or the buyer, you will want to carefully negotiate the mortgage contingency clause, property appraisal and inspection, and closing date. Financing real property also has a number of implications. If you are a potential buyer, you will need to secure a mortgage commitment letter from a lender to finance the purchase of the property. However, you should understand the legal implications of the terms of your loan. For instance, if the loan has a balloon payment, you will need to pay this one-time large sum once the loan matures. Otherwise, the lender has the right to take your property. If you want to refinance your mortgage, you may need to add a co-borrower to the deed in order to secure the financing. In other words, you will no longer be the sole owner of the property. The real estate lawyers at Pulgini & Norton have more than 40 years of experience guiding Weymouth residents through property transactions and workers’ compensation claims. We offer knowledgeable guidance and representation in buying and selling homes, financing, zoning, and tax issues. We also offer capable and experienced counseling to injured workers and their families. If you were hurt at your job, we can advise you on your right to benefits and assist you in pursuing them. Call us today at 781-843-2200 or fill out our online form to schedule an initial consultation.